This is the Legendary* Sock Massive. 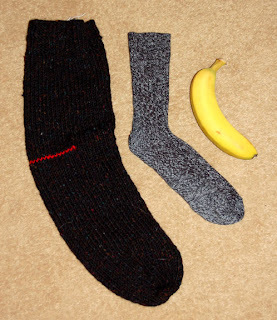 To the right is her boyfriend's actual sock size. And an average banana (just so you know he doesn't have childs feet). I like to think that so much love and effort have gone into that sock that it's swollen it to giant Shrek-like proportions. It gives us all the giggles everytime we see it. *legendary within our Crafty group, at any rate. The Sock Massiiive was the bane of my life for some time. Now it has been elevated to legendary status, I feel the angst was worth it. I think I should now finish the heel section, just for good measure. Maybe I'll meet a giant in my life, possibly even with one leg, who will be happy to have The Sock Massiiive.